By the time I got up this morning, we had arrived at our first site. The action was starting. It has taken four days of preparation to get ready for this. We are located at about 1°N and 90°W. The closest rocks are 2840 m away...straight down! At each site, we are conducting water sampling and sediment sampling from shallow (~0.5 m), medium (~5 m) and deep (~38 m) depths. Today was a day of mixed successes. It took three hours, not the predicted four, to retrieve the water and CTD sample. 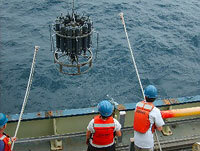 The Niskin Rosette, or CTD (conductivity, temperature, depth). This is a set of 24 10-liter bottles in a steel frame. Each bottle is open at the top and bottom until a trigger is set off by a computer in the ship. Then the top and bottom snap shut, isolating the water from the desired depth. The rosette is sent all the way to the bottom then as it is pulled to the surface, the bottles are closed one by one. Attached to the Niskin Rosette are temperature probes and conductivity meters that are constantly sending data to computers on the ship. When the rosette gets to the surface, the scientists have samples from 24 different depths along with data about the temperature and conductivity of the water at those depths. Water is sampled for several different analyses including nitrogen-fixing, microbiological culturing, mineral-phase, and nutrient levels. After the CTD, the coring crew successfully retrieved a 3.6 m sample using the gravity coring system. This system is made up of a 5 m long PVC pipe with a weight at the top. It takes two hours to lower it through the seawater until it is just above the bottom then dropped. The weight propels it through the mud layers. When it stops, a "catcher" holds the mud in place. After another 2 hours, the core is brought up to the surface, water is siphoned off the top of the core and the ends are capped. We used pipe cutters to cut the lengths into 1.5 m sections, we cap the sections and store them vertically in 2°C storage. When the scientists are ready, we cut the sections into smaller "whole-rounds" and deliver them to the labs on the ship. Some of the small whole-rounds are placed in vises that squeeze out all the water for chemical analyses. Some of the whole rounds are sampled by the microbiologists. At sediment station, where I work, the different sediments are identified, described and classified. The sediment we retrieved today was varying shades of sage green clay with layers of foraminifera fossils, tiny little shells made by ameboid protists. The long core will be deployed twice at each station. This is a very new technology and some of the bugs are still being worked out. Today's first launch started out well but when the coring system made it to the bottom, it did not release into the sediment. This is a huge disappointment. Later tonight they will try again. The last thing that happened tonight was the retrieval of the multicore, an array of five sampling tubes, each 0.68 meters long. The multicore captures the very delicate uppermost sediments and bottom waters. This is a challenging system to use because one wrong move and all the sediment is lost. Four hours after it was sent down, the multicore came to the surface. Only two of the eight bottles were successfully filled. The other six were empty. The sediment was the same sage green color by had a rich dark brown layer on top. I am hoping to talk to some of the scientists who worked with these samples and learn more about what they saw. 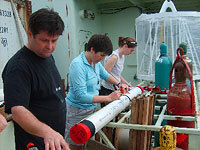 After the multicore was retrieved, those of us working in labs stood out on deck watching the sea beneath the boat. After a bit, we all noticed squid in the water all around us. Here we are, no land in sight, the cloudy night sky is as dark as it can be and there are birds flying all around us, there is squid in the water and we are able to appreciate where we are and what we are doing. What does CTD stand for and how is it measured? Why do you think it is important to store the samples at very cold temperatures? Look up "foraminifera" and sketch one of the species. What are their shells made of?